Stour Space has offered space for creative pursuits since 2009. 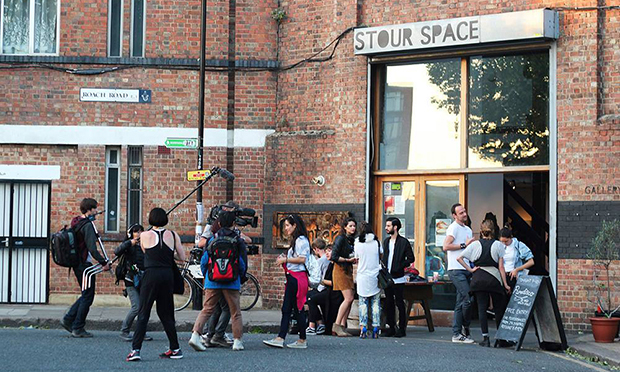 Community venue Stour Space, home to around 40 artists, a gallery and café, is trying to raise £50,000 by this Friday to guarantee its future in Hackney Wick. The place has been a lynchpin for the local creative community since opening in 2009 – offering affordable studios, prices for which have been frozen for six years, and co-workspace for freelancers at no cost. But a combination of rising rent, which has doubled over the past decade to £90,000 a year, and unfortunate timing has left the non-profit with a cashflow problem, and it needs to raise thousands of pounds at short notice to extend its lease at 7 Roach Road. Failure to do so will leave the venue – twice listed as an Asset of Community Value – its staff and the artists who have made it their home facing an uncertain future. Neil McDonald, Stour co-founder and one of its three directors, told the Citizen: “It’s a timing thing. If we had more time to raise the money then we’d have no problem, but we don’t. “If we don’t raise it soon then Stour Space may close down before summer, and with it all the social benefit services we provide to our community through this site. “This means our beautiful canal-side café, gallery, event space and studios won’t be here anymore. The venue is home to about 40 artists, who have enjoyed a price freeze for the past six years. The directors have set up a fundraising page at DonorBox.org which so far shows donations totalling £2,060 – but this doesn’t include takings from the tills or events. McDonald estimates that the true total raised so far is closer to £7,500, and he says that if this reaches £22,500 by Friday, it should be enough to allow the venue to kickstart the lease extension. The rest of the money will go towards fundraising costs and fulfilling perks for donators, which range from drinks and meals for pledges between £10 and £50, to free use of Stour’s various spaces and live performances for anything between £500 and £10,000. McDonald praised the council for pushing through rent caps in the neighbourhood centre of Hackney Wick, but said: “This is a small percentage of what will and has has been lost, and who knows who will win a tendering process to occupy it and then how much they will rent it out for to the end user. “It’s a way off yet though and we hope that grassroots civic venue’s like Stour and Grow will still be around to apply for this opportunity. Despite the Roach Road appeal, Stour is set to snap up the lease for the Old Baths, with plans to build 10,000 square metres of affordable workspace, but this won’t be ready until the end of the year, so tenants could find themselves with nowhere to go should the fundraising not hit the target. Stour is also committed to keeping the existing tenants at the Old Baths. 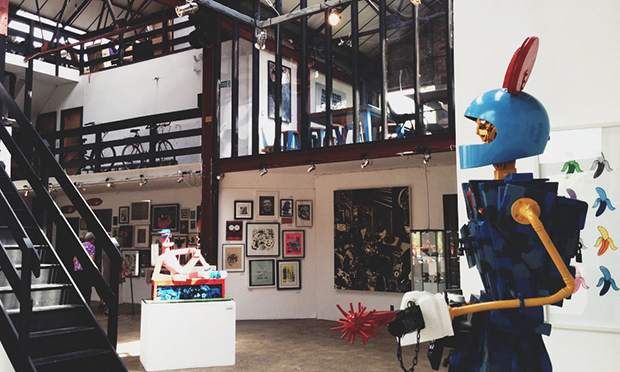 The gallery has played host to 1,500 local artists over the past decade. When asked if the venue would ever consider increasing its prices to avoid situations like this in future, McDonald said: “We believe that is is so important to maintain affordable rents for creative purposes. He added: “The Stour business model also works on a basis of association of value, not just financial but also social, environmental, people’s health and happiness. “For example, people are welcome to come and work on our mezzanine hot desk spaces and the likelihood is, they’ll buy a coffee, lunch or a beer at the end of the day. McDonald did take aim at development in the area, particularly the nearby Monier Road site, which he says has led to a loss of takings for Stour of around £400,000. He says it takes time to build a loyal customer base, and with so many people moving out to make way for new developments, Stour is having to rebuild. Stour is raising money in a number of ways, one of which is a pay-what-you-feel Tuesday dinner club, which will go ahead tomorrow. And McDonald says just using the space, buying a coffee or lunch, having a few drinks in the evening, taking part in a workshop, will mean your money can be put towards the appeal. 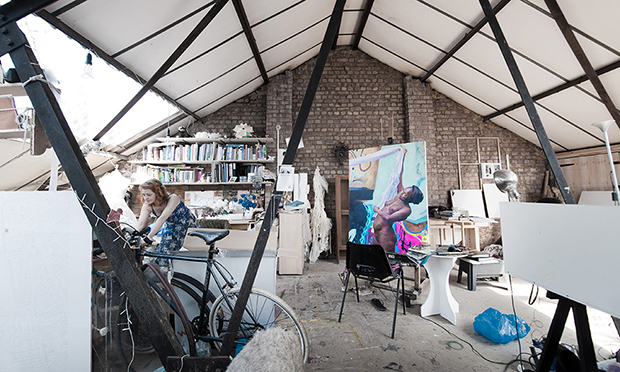 McDonald continued: “Stour Space is the oldest public venue in Hackney Wick and Fish Island, it was built by the local community and is the only true civic space on Fish Island. “Hundreds of new residents are descending upon the area and without Stour, Fish Island will have no cultural centre, no amenities and no public services. “It has twice been listed as an Asset of Community Value, one of the first in the country and the only one to focus on arts and culture.